The Fence Company of Northern Michigan is a full service fence installer. 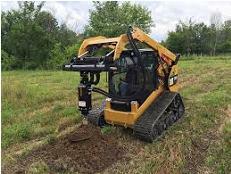 We make sure the appropriate permits are obtained and we call Miss Dig to make sure underground obstacles are avoided. We place posts below the surface of the ground to make sure they do not frost heave and we cement them as appropriate. The Fence Company of Northern Michigan has the equipment and the know how to install fence all year long. We have invested in the heavy equipment that makes it possible and we have the experience that makes it practical!